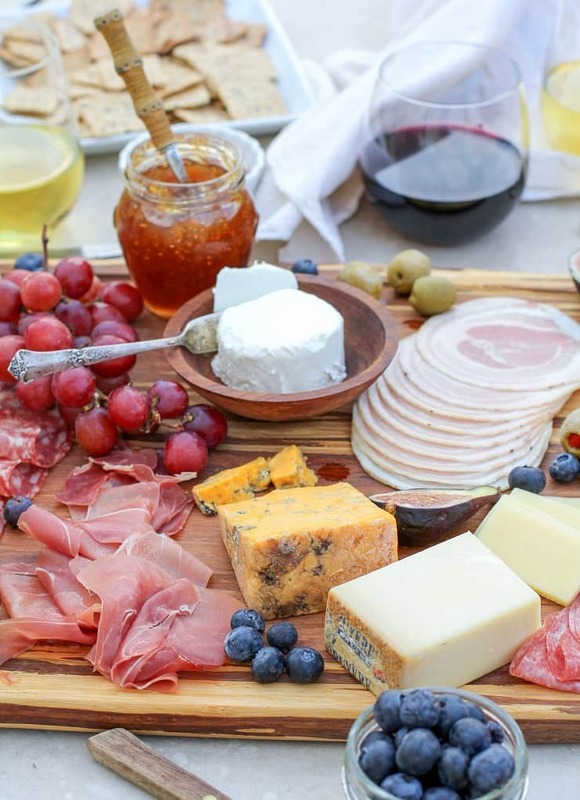 How to make a crowd-pleasing charcuterie board, complete with cheese and meat selections, wine pairings, and suggestions for incorporating seasonal ingredients to make a winning wine and cheese board any time of year! Appetizers — they’re the new dinner party. I’ve noticed tapas and appetizers (or apps as my friends call them) have become the new To Do for get-togethers. It used to be, my friends and I would throw some burgers on the grill and crack open some cheap beers, but now that we’re getting older, we’re all about doing the sophisticated things. 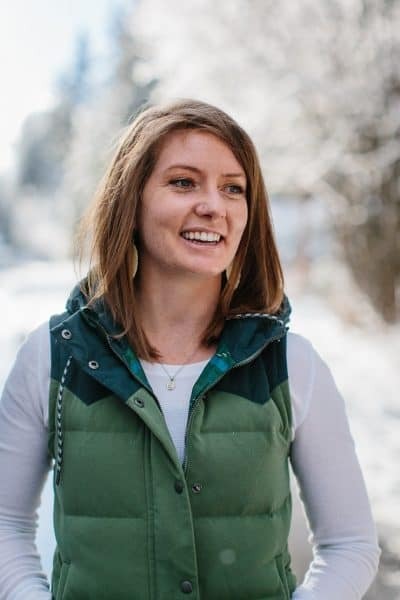 Things like meeting up for a glass of wine and an appetizer at a cool local bar or pairing food and alcohol with a small group in one of our backyards, complete with the musical stylings of Snoop Dogg Pandora Radio. 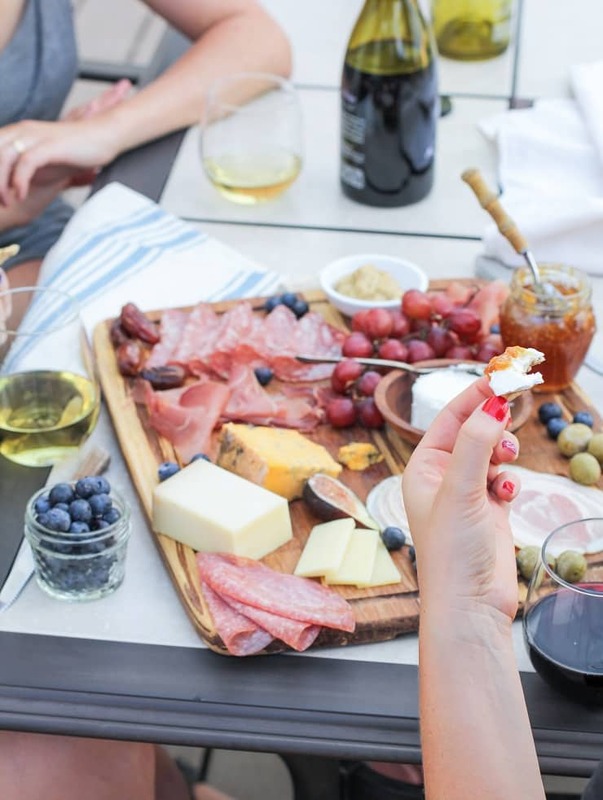 Being the person in charge of appetizers can sometimes be stressful since you never know what your friends are in the mood for, which is where the charcuterie board comes into play. Ahhh, the charcuterie board. The board that is full of mystery, variety, explosions of flavor … the board that everyone (including myself) has trouble pronouncing. 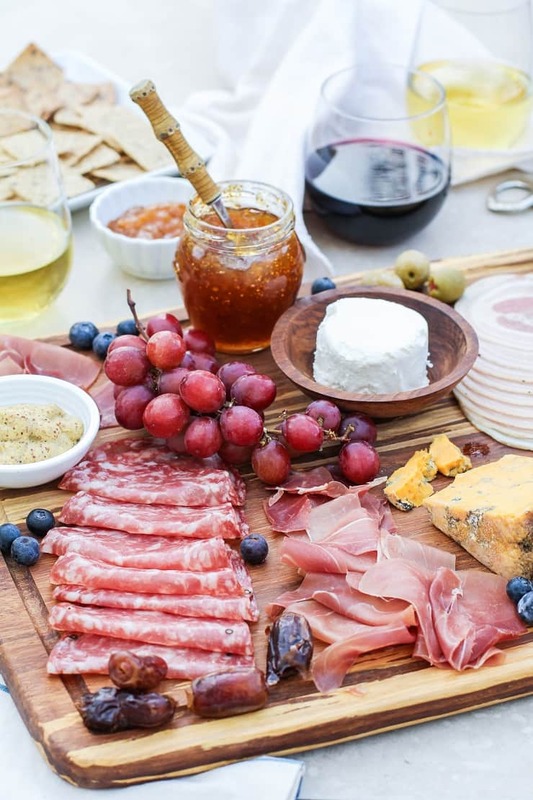 In case you’re unfamiliar, charcuterie (prounounced shar-kood-eree) boards are meat and cheese boards that typically include a variety of items that can be paired in mouth-watering combinations. They usually include various ingredients that complement the meats and cheeses for a fun do-it-yourself appetizer experience for your guests. 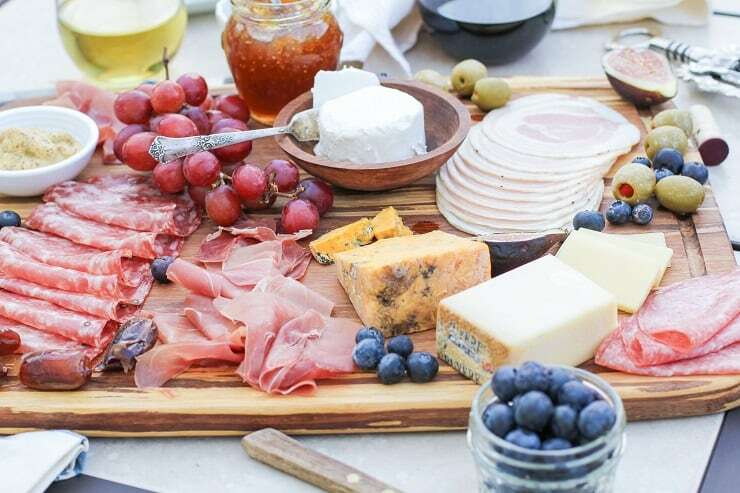 I love charcuterie boards because they can please just about any palate, and your guests can whip up all sorts of combinations to keep their experience unique and entertaining. Plus, they can be actioned any time of year, using seasonal eats. 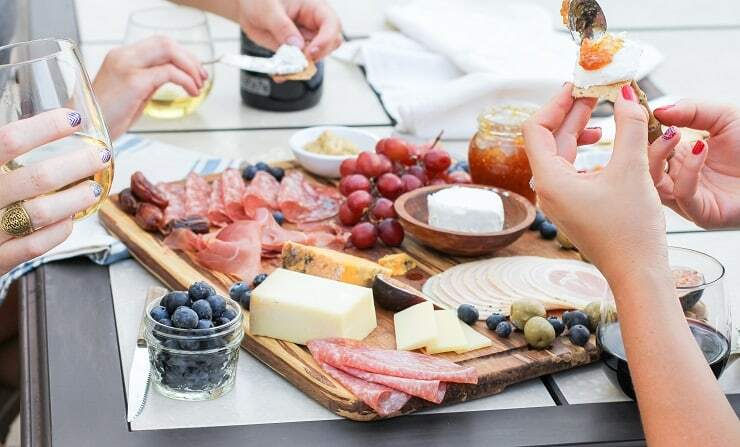 During the summer months is when most of us do the majority of our entertaining, and charcuterie boards are brilliant for pleasing any crowd, while taking some of the workload off your shoulders. We don’t need to turn on the oven or hover over the stovetop or spend a great deal of time cooking. All we do is add arrange a variety of ingredients to a large serving board with crackers and/or bread and let our guests loose. This no-bake appetizer extravaganza keeps your friends and family satisfied until the main course comes around. While putting together a charcuterie board may seem overwhelming at first glance, it’s actually quite easy and enjoyable. I have all sorts of tips for putting together the ultimate charcuterie board that doesn’t require a huge investment or a special butcher or market . So let’s dive in, starting with some basic tips. Select a variety of meat and cheese, meaning an assortment of mild, medium and bold flavors. Some people prefer softer, mild meats and cheeses, where other folks love big, bold flavors. Be sure you have options for both mild and bold flavors, as well as middle-of-the-road options. Add seasonal fruit to the mix. While the main event attraction of a charcuterie board should be the meat, it is always smart to include fresh in-season fruit to add sweetness to the salty and to change up the experience. If you want to get extra fancy, you can roast or grill fresh fruit. Jams or preserves: Include 1 or 2 jams or preserves for some added flavor and sweetness to balance out the dry and salty meat and cheese. Fig spread goes marvelously with many cheeses and meats, so I always like to include it. I also like to include apricot jam, but raspberry or grape jam works, too. 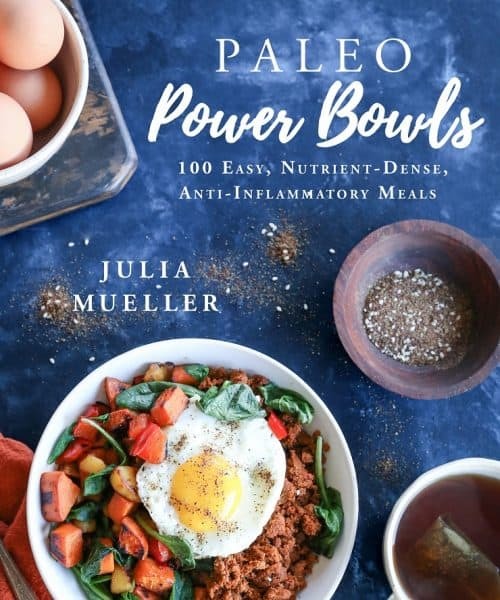 Again, you can step this up by using homemade jams, but store-bought works great and chances are you already have several options in your pantry. Provide something briny to pair with the meat and cheese. Pickled vegetables, such as gherkins or pickles, olives, pickled jalapenos or pepperoncinis are great on charcuterie boards. They can be paired easily with the bold meats, such as salami or sopressata, and add a mouth-watering tang. Other spreads: You may also include any of your favorite spreads, such as stone ground mustard, tapenade, pate, hummus, and/or white bean dip. These spreads are great for smearing on sliced baguette for stacking meat and cheese on top. Etc. : Get creative by including anything else you think your friends would enjoy. For instance, cheese or chocolate fondue with fresh fruit and bread for dipping, dark chocolate bars, roasted or raw nuts, compound butters, nut butters or hazelnut spread, etc, etc. Alcohol: When appropriate, include alcohol to your charcuterie experience. Wine and beer pair excellently with meat and cheese and can enhance the flavor experience. Generally speaking, you want to pair bold-flavored meat and cheese with bold-flavored alcohol. For instance, goat cheese, smoked salmon and prosciutto pairs well with white wine, while salami, cheddar and blue cheese go great with red wine. Crackers & bread: While your guests can get along perfectly well without crackers or sliced baguette, these items can be great for pairing a variety of ingredients for providing stability to the bite. I like to provide gluten-free crackers as well as regular crackers. I choose crackers that don’t have a huge amount of flavor, added herbs or salt so that the crackers don’t detract from the flavor of what’s being added to them. The finished product: Putting all of these elements together, you will end up with a board that has a variety of pairing options. Here is what I included on the board pictured in this post: For the meat, I chose prosciutto, pancetta, sopressata, and Genoa salami. For the cheese: goat chevre, Gruyere, English blue cheese. In the fruit department, I added fresh red grapes, figs, blueberries and dates. For the spreads, I used a fig spread and apricot preserves, both of which I already had on-hand. Last, but not least, my briney elements were brown mustard and olives. I also had a variety of white and red wines, as well as beer available in the refrigerator for whoever wanted it. Most grocery stores have a deli section with a complete selection of aged meats and cheeses. Even if you don’t have a huge bank of knowledge on various meat and cheese pairings, selecting several quality meats and cheeses is key to a fun board. I picked up a few packages of Private Selection prosciutto, pancetta, sopressata and Genoa salami, which came pre-sliced. Easy peasy. Generally, aged meats are my go-to over other sliced deli meat because they’re full of flavor and tend to be very easy to pair with most cheeses and spreads. In this way, you don’t need to go to the butcher, an expensive natural food store or own a meat slicer — simply use what’s already in the deli. Let’s talk cheese. I typically select at least three cheeses: a mild, medium and sharp cheese. I like to provide at least one non-dairy option, such as sheep milk or goat milk cheese. Goat chevre is my go-to mild cheese and seems to always be a favorite among my friends. For my medium-bodied cheese, I go for a cheese that will pair well with both white and red wine and most beers: Gruyere or Gouda. And finally, I always bring a blue cheese (but on the mild end of the blues, nothing too blue-y or sharp) since it pairs so well with bold meats and heavy red wines. Before your friends begin digging in, take a quick minute to explain to them what everything is. Just a general run down of what everything is called is helpful to take a little bit of the guesswork out of making selections. Your friends will have a blast figuring out what flavors they like best together. For this round of charcuterie-ing, my favorite combo was goat cheese, prosciutto and fig spread on top of a cracker, followed by a sip of white wine. Great food, great company — what more could you need for a pleasant evening? One of my favorite parts about getting friends together to enjoy a charcuterie board is we all inevitably end up discussing our favorite profiles. Simple conversations like these are sometimes the most relaxing and memorable. And that is all, folks. As my high school math teacher would say, “Nothing to it but to do it.” What are your favorite charcuterie-ables? This content was created in partnership with Kroger Family Stores using free products provided by Kroger. Mmmmm this looks so yummy, my friend. And yes I totally agree with you when you say that Appetizers are the new dinner party!!! I love to make appetizers and invite my friends over to eat, drink and talk 😉 Hope you have an awesome weekend!! UMMMM so much yes. This looks beyond epic!! You are the charcuterie board MASTER. I feel like there is really something for everyone on this platter. Last I checked, sheep and goat’s milk cheese are not non-dairy. Milk is dairy, regardless the source. Brought this as an appetizer for our family Thanksgiving last night and it was a huge hit! Thanks for breaking it down so easy. Technically all cheese is considered dairy but sheep and goats milk can be easier to digest. My doctor tells me to read the labels as I can handle sheep and goats milk but not cows milk. Nice for people to consider this as well as gluten free items as there are many to choose from now.